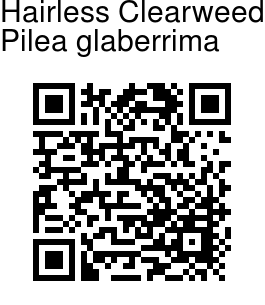 Hairless Clearweed is a hairless perennial herb found in damp shady places in the Himalayas, from Nepal to NE India and SE Asia. Stem is woody below, up to 2 m tall, with angled branchlets. 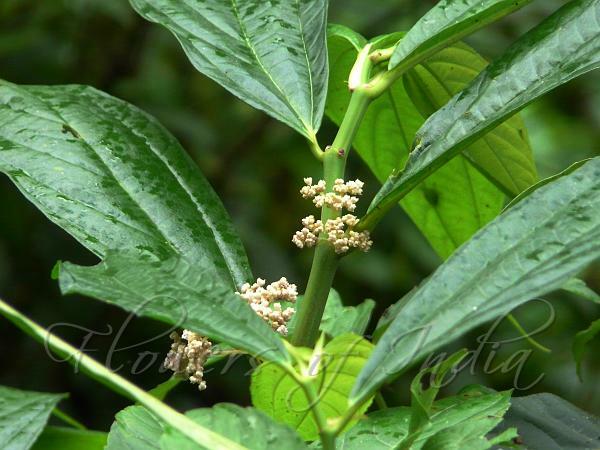 Leaves are obliquely elliptic- lanceshaped, long-pointed, with untoothed margins. Leaves have 3 nerves, and are narrowed towards the base, into the leaf-stalk. Stipules are persistent, triangular or lanceshaped. Flowers are white or cream, borne in short-stalked branched clusters 1-3 cm long. Male flowers are round, 1-1.5 mm across. Female flowers have 0.5 mm ovary. Seed-capsules are ovoid, compressed, smooth, about 1.25 mm. Flowering: April-September.